Bone density is somewhat of a hot topic in the sense that the media often reports on osteoporosis and various treatments, drugs and ways to handle the condition. However, little attention is given to risk factors, symptoms and the prevention of osteoporosis. During the menopausal transition, your declining levels of oestrogen mean that you begin to lose the benefits of this bone-enhancing hormone. The longer you are without the protective effects of oestrogen on your bones, the greater your risk of bone density loss and the development of osteoporosis or osteopaenia. A bone densitometry test can measure bone in the lumbar spine and hip. Unfortunately, these tests only tend to be done after there are obvious symptoms or signs of a potential problem with bone density – a hip fracture, for instance. By then, bone density could be low enough that a woman is given a diagnosis of osteoporosis. The tests will assess your bone density against an average and if your bone density deviates below the average by 1.0 to 2.5, you will likely be diagnosed with osteopaenia. If it deviates more than minus 2.5, then the results would point to a diagnosis of osteoporosis. Age is an important risk factor in relation to menopause. The longer your body is without the protective effects of oestrogen, the more susceptible you are to thinning bones. This is why an early start on good lifestyle habits and protective measures is important to keep your bone density healthy and adequate. Although you can make healthy modifications to your lifestyle and diet when you enter menopause, you have to keep in mind that bone loss is not an overnight process. There is a mistaken belief that there is no turnover with regards to bones. However, your bones are constantly being 'broken down' and 'rebuilt' during the process of bone metabolism. When the building of bone falls below breakdown, bone loss occurs. It generally occurs over many years and while you can prevent bone loss to some degree through healthy measures, it is far more difficult to increase bone mass once bone loss has occurred. For this reason, the process of bone protection should begin very early on – ideally in a woman's early twenties, when she should be increasing and building her 'bone bank.' This way, some of the inevitable bone loss during menopause is considered affordable whereas if you begin menopause with already thinning bones, you become even more at risk for osteoporosis. It's important to get adequate calcium each day. Depending on where you live, the nutritional requirements mandated by dietitians and the government will vary for calcium. 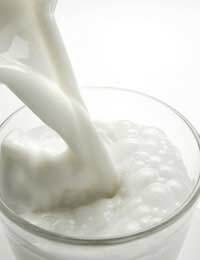 Eating calcium rich foods such as dairy products on a regular basis is important for attaining adequate calcium levels. Also, it is often recommended that women supplement their diet with calcium tablets. You should keep in mind that calcium is best absorbed when taken regularly throughout the day, which means that if you are taking a supplement, try to take smaller amounts several times a day rather than one, concentrated pill once a day. Make sure you include the important cofactors for absorbing calcium, such as vitamin D. You can aim to consume vitamin D rich foods and also try to get fifteen minutes of sunlight each day outside of peak hours, although this can be difficult depending on where you live. Magnesium is another mineral that is helpful to take with calcium – many supplements will include magnesium along with calcium and vitamin D.
Some research has associated carbonated drinks with a decrease in bone density, so it's wise to avoid these drinks – most of which are unhealthy and loaded with sugar as well. Caffeine is another substance that is linked to losses of calcium, which means you may choose to limit or avoid caffeine. It also can trigger hot flushes during menopause, making it all the more reason to avoid during this time. In terms of exercise, it's a good idea to do exercises that provide some impact for building bones. Walking is one of the most basic exercises that can help you preserve bone mass. Jumping rope is another excellent one as are any weight-bearing exercises. In particular, weight-bearing exercises have been shown to prevent bone loss and in some cases, increase bone density. None of the lifestyle measures are a replacement for the loss of oestrogen that occurs during the menopausal transition. For this reason – and others – some women choose to take HRT. However, there are a number of risks associated with HRT such as an increased risk of certain kinds of cancer and an increased risk of stroke. You should carefully weigh the benefits and risks before choosing HRT. Your doctor will be important in helping you evaluate your level of risk and your current health prior to choosing HRT for your bone health and menopause symptoms. Menopause brings with it many changes and unfortunately, bone density loss from a reduction in the hormone oestrogen is one of these physical changes. There are, however, ways to build up your bone prior to menopause as well as prevent excessive bone loss during this important change of life.